Council approved a "memorandum of understanding" on the $34.9 million deal. A final development agreement will be set once FC Cincinnati is formally asked to join Major League Soccer (MLS). The city's money will be used to pay for site preparations and infrastructure improvements needed to support the stadium. Earlier in the day, the Budget and Finance Committee approved the item. In addition, the team and the West End Community Council signed a community benefits agreement, though some stadium opponents say it's not enforceable. "I am excited and I am hopeful that very, very soon we will be calling FC Cincinnati a Major League Soccer team," said Council Member P.G. Sittenfeld, who helped broker the deal that city council ultimately approved. "But I'm a yes vote today because I think this is good for the people of the city of Cincinnati and the people that I try to serve and represent." Council Member Tamaya Dennard, who opposed the deal, called it "sad" and said the $100,000 per year in the ordinance for community services is not enough for the West End Community. Dennard was joined in opposition by council members Wendell Young, Greg Landsman and Chris Seelbach, who said the city is providing public funds only to make "billionaires" richer. "The benefit to the community is pretty much in the short term," said Council Member Wendell Young. "The real beneficiaries are the people who own the stadium and will make a lot of money from it." Mayor John Cranley praised the proposal for re-investing in the urban core. But he did comment on the narrow vote to approve it. "I've got to the honest with you, it's worrisome," Cranley said. "That what I think is obvious that we should embrace growth and private investment into the city is so narrowly approved on a consistent basis." FC Cincinnati would build its facility on the site of the current Stargel Stadium, which is used by several Cincinnati Public School district programs. In return, the team will build the district a new stadium along Ezzard Charles Dr. across from Taft IT High School. FC Cincinnati promises to spend $13.5 million for that new stadium, including land acquisition and construction. The club will also make a lump sum payment in lieu of taxes based on the projected values of a stadium for the first 10 years. After the first 10 years, the club will make an annual payment consistent with CPS's 1999 tax abatement agreement with the city of Cincinnati. Major League Soccer owners are meeting Tuesday and could discuss an expansion team for Cincinnati during that meeting. WVXU's Bill Rinehart contributed to this story. A tentative deal is in place for FC Cincinnati to build a soccer-specific stadium in the West End, likely bringing the team one step closer to a Major League Soccer franchise, if approved. Cincinnati Councilman P.G. Sittenfeld announced his support of an FC Cincinnati stadium in the West End, unlocking a key vote for the embattled stadium to move forward in the neighborhood. The Rev. 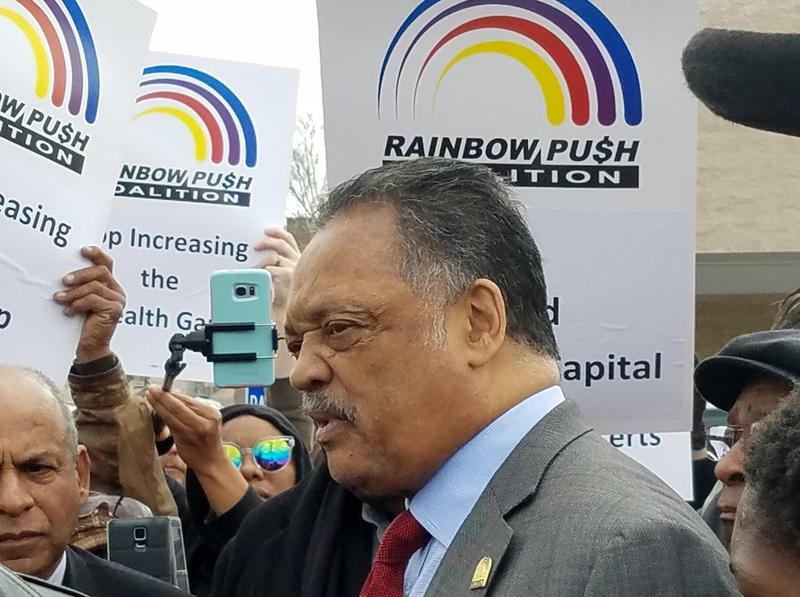 Jesse Jackson is leading a national boycott of Cincinnati-based Kroger following the company's decision to close two stores in predominantly black Memphis neighborhoods and a third in Clarksdale, Miss. He elaborated on the boycott Tuesday while standing outside the former Walnut Hills Kroger, which was closed last year when the University Plaza Kroger opened in Corryville.